Tyler and Duncan fight to stay alive in “Alpha and Omega”. The chills are there. Of course the mystery is as well. As usual, expect some laughs. But most of all, the heart that has been characteristic of “Locke & Key” is beating as strong and healthy as it did when the Locke family first set roots in Lovecraft. Joe Hill and Gabriel Rodríguez bid “Locke & Key” a triumphant farewell with “Alpha & Omega”, the final chapter of their beloved series. Hill and Rodríguez have put the Locke family through the wringer for five volumes, and “Alpha & Omega” does more of the same, however the danger and body count have been amplified exponentially. However, the most gratifying quality of the book is seeing the development of the Lockes from where they were emotionally in “Welcome to Lovecraft”, the series’ opening volume. Hill explores the developing maturity of the eldest Locke children, Tyler and Kinsey, in a couple of key scenes at the beginning of the book. For the uninitiated “Locke a& Key” follows the lives of the Locke clan after the death of patriarch Rendell Locke by a former student, Sam Lesser. Rendell’s wife Nina is left to pick up the pieces of her family’s shattered existence by bringing her three children, Tyler, Kinsey and Bode, to her husband’s family home, Keyhouse. Located in Lovecraft, Massachusetts, Keyhouse is a centuries old estate inhabited by Rendell’s younger brother Duncan. Since their arrival, the Locke children have found numerous magical keys with the ability to do wondrous and horrifying things. The Lockes have been pursued by a demon named Dodge since they arrived at Keyhouse, and who has now possessed seven-year old Bode. Rodríguez’s artwork has evolved beautifully over the years, his lines are softer and his characters are more human than they’ve ever been. The artist’s unique sequential storytelling techniques are familiar, especially his use of repeated panels to convey movement and the passage of time. Rodríguez’s characters benefit from the less pronounced line work, the finer details allow for more thoughtful expressions. It’s a good thing too since “Alpha & Omega” is filled with powerfully dramatic scenes featuring the main characters and supporting cast. In the opening chapter, Tyler recounts his greatest regret for a video his classmate Scot is making for the graduating class. Tyler looks to the side, he looks down, and rarely looks directly into the camera as he tells his story. Rodríguez captures the young man’s thoughtful reflection as Tyler recalls his greatest regret for his friend’s video. Hill has taken Tyler and Kinsey on a realistic and uneasy emotional journey. They’ve gone from being a couple of youngsters who blamed their parents in many ways for the situations that have occurred in Keyhouse, to maturing young adults who are coming to peace with the fact that parents, especially theirs, are only human. In the first chapter, Kinsey has a moving scene of understanding where she admits that she’s been guilty of judging her mother unfairly. Hill’s desire to incorporate genuine emotions in his characters is what has made “Locke & Key” a pleasure to read for six volumes and the writer goes to greater lengths to bring a three-dimensionality to his cast. “Alpha & Omega” is one of the more straightforward stories in the series. Everything takes place in the span of about a week as the graduates of Lovecraft Academy prepare for their senior prom and the after party Cave Rave that takes place in the caverns below Keyhouse. Bode, who has found the Crown of Shadows and the Omega Key, plans to use the night of the prom to finally open the Black Door and let the demons on the other side out. Unfortunately for the partygoers, the Black Door resides mere footsteps away from the Cave Rave. The simplicity of the story allows for a substantive amount of character work as well as an abundance of unsettling action. 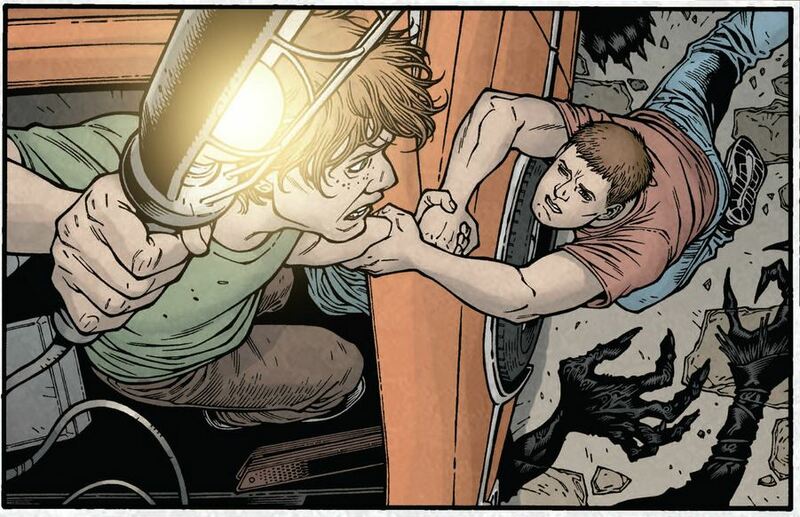 Hill and Rodríguez have raked the characters of “Locke & Key” across the coals before, but the kid gloves have been taken off as Bode makes a final strike against the rest of the Locke family to ensure they are prevented from obstructing his ultimate goal, which turns out to be hellishly wicked. Using the Crown of Shadows, Bode is able to subdue Nina, Duncan, and Tyler as he attacks the unsuspecting students with an army of frightening shadow creatures he is able to dream up and control. Rodríguez’s attack on the students at the Cave Rave is awesome. Hill steps back and lets the artist take control of the pages as the creatures grasp, maim, and rip the kids to shreds. However, the ones who are left alive may actually fare worse. In fact, I’m pretty certain of it. Hill and Rodriguez know how to set up a nightmarish scene and “Alpha & Omega” has plenty. 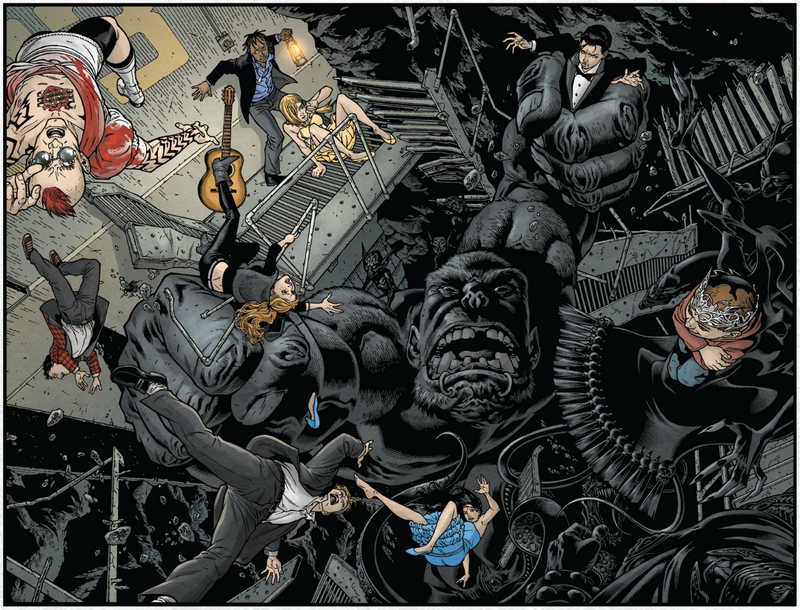 Jay Fotos’ colors are sensational, adding richness to Rodríguez’s already textured backgrounds. If not for all of the shadow creatures, it would seem that this volume is one of the brightest in the series. In a sequence that acts as a nice bookend to “Locke & Key”, mentally-challenged Locke family friend, Rufus Whedon, makes his way to Keyhouse to stop Bode. Rufus’ touching voyage is the antithesis of Sam Lesser’s from “Welcome to Lovecraft”. Where Sam was seduced by Dodge and willing to destroy the Locke clan, Rufus is on a mission to protect the family with little fear of the creature who took his mother from him. For the invested, and if you’ve made it this far into the series, that’s you, there will be anxiety with the turn of every page. We’ve grown to love the Locke family and we want, no, not want, we need them to be safe. Imagining them not making it through the end of the story after everything that they’ve survived to this point becomes near unbearable. And getting up from reading their final adventure in one sitting is unlikely.